The latest efforts of our research at UCL have been focused on manipulating Positronium (Ps) atoms in highly-excited principal quantum number n states (Rydberg states) [PRL. 114, 173001]. In one of our latest works we showed how we can exploit the large electric dipole moment of low-field-seeking Rydberg states (those states which have positive Stark shift) to confine them in a quadrupole “guide” [PRL 117, 073202]. As a direct follow-up to that study, we devised a modified version of a quadrupole guide with a 45° bend that would allow us to perform velocity selection on the atoms being guided by tuning the efficiency with which the Rydberg Ps atoms are transmitted through the bend, in addition, in our previous set-up we experienced technical difficulties since the detection scheme was in-line with our positron beam, so having a curved guide would also be beneficial for that reason. 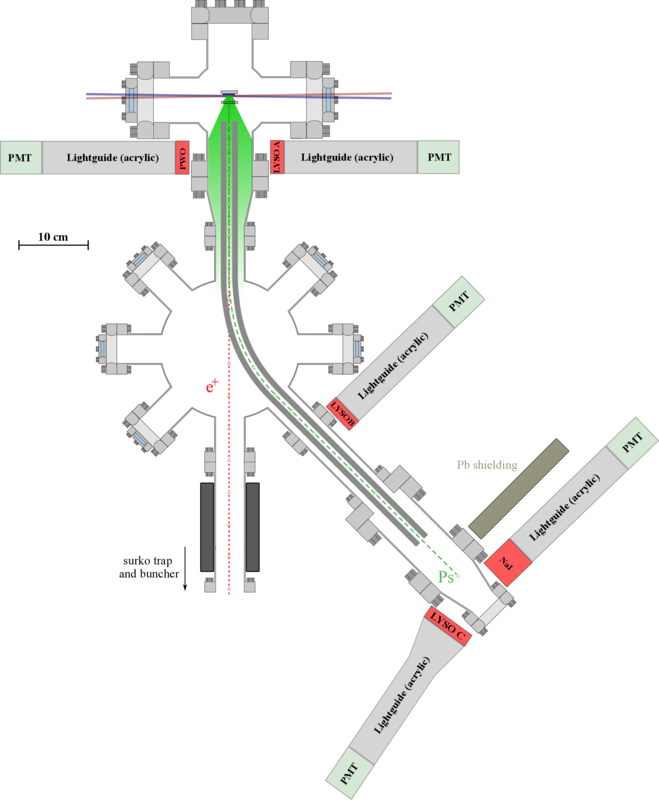 The schematic figure above depicts our current experimental setup, which we have used to guide Rydber Ps atoms around a 45° bend into a region off-axis with our positron beam. We have not yet implemented velocity selection, but we have clear evidence that we can efficiently guide Ps atoms in this configuration. The left panel in the figure above shows the time of flight (TOF) distribution of n = 14 atoms excited to high-field seeking states (as measured by the detectors at the end of the curved guide, i.e. “LYSO C” and “NaI”), and a background wavelength with is off-resonant with any transition, essentially acting like a “laser on” and “laser off” measurement. The right panel shows the background-subtracted trigger rate for this measurement (“laser on” – “laser off”), which shows clear evidence of atoms with a TOF arrival time of ~8 . In addition to this being a stepping stone to demonstrate velocity selection due to the acceptance of the curved section of the guide, we may also improve this set-up into eventually developing a ring-like stark decelerator, and other Ps atom optics.